Preschoolers are beginning to engage in and build upon social and emotional relationships. Not only are they dealing with the stress of being away from home and their primary caregivers, but they are also learning to negotiate with peers, share and take-turns, all while achieving a sense of self. Play lets students act out fears and emotions that they cannot verbalize, while taking responsibility for themselves and others. 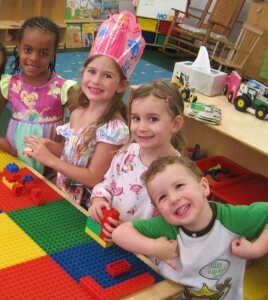 Play is the key factor in peer relationships at this age. It encourages behavior in a pro-social way. Lastly, play is a forum for thinking, negotiating and problem solving. Students learn to work collaboratively and listen to friends’ ideas and influences. They are learning to communicate emotions effectively. Students at Park Prep Academy are grouped in heterogeneous age groups to encourage and promote social interaction. Both head and assistant teachers act as facilitators to each of the small play groups to ensure that each student’s voice is heard and feelings acknowledged. In the event that conflict arises, a staff member serves to diffuse the situation by allowing each student to express how he/she feels. The students are encouraged to use clear language to help them explain how they’re feelings but also understand how the other student feels. Once everyone’s feelings are acknowledged, the teachers help students come to an amicable resolution together. With a hug or a handshake, the students return to their station and continue the activity.